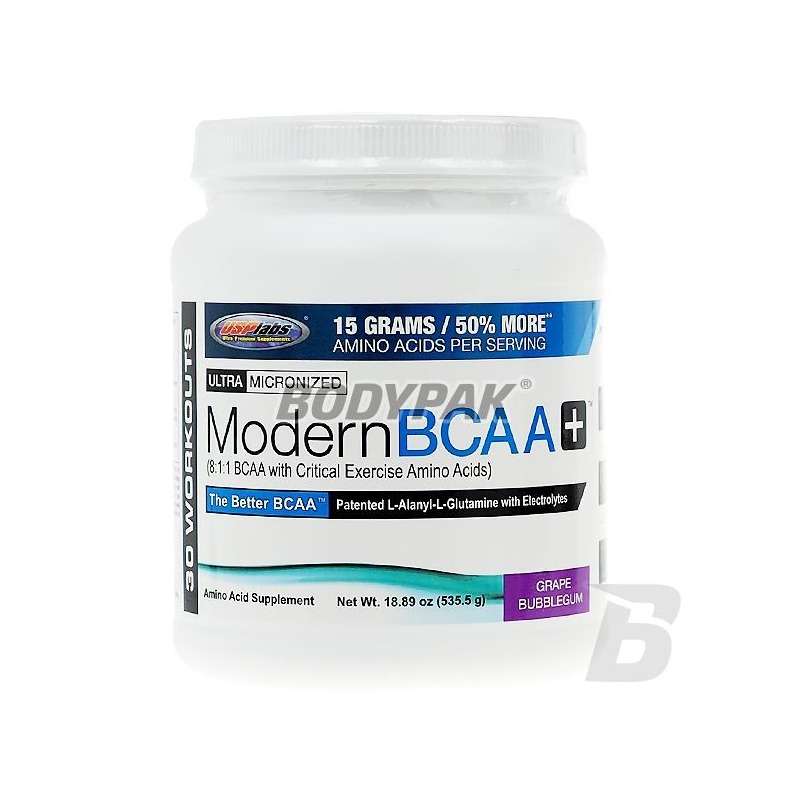 Modern BCAA - is a food supplementing the diet with micronized branched chain amino acids (BCAA) - leucine, isoleucine and valine, and enriched with L-alanyl-L-glutamine. USP Labs Modern BCAA + - is a food supplementing the diet with micronized branched chain amino acids (BCAA) - leucine, isoleucine and valine, and enriched with L-alanyl-L-glutamine. Regular supply of these amino acids is necessary for proper muscle protein regeneration. 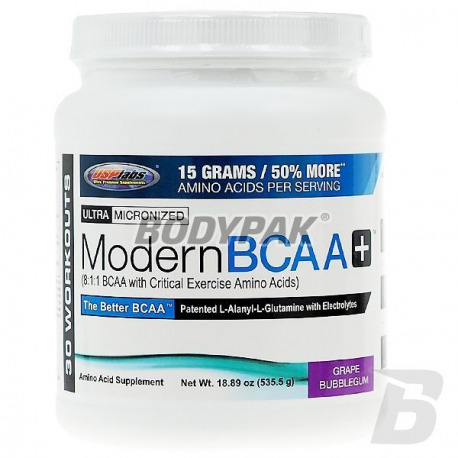 Use of Modern BCAA before training increases strength and endurance during training. Micronized L-Leucine - the synthesis of skeletal muscle in several ways: it increases the secretion of insulin, a powerful anabolic present in our body, affects the activity of protein kinase S6 accelerates the phosphorylation of eIF4E-binding protein and affects the degree of association between proteins (EIF) and the 4E eIF4G . All this, despite the complex sounds and naming comes down to a very simple theorem - Leucine increases the degree and speed, use protein to build muscle. Micronized L-Isoleucine - providing large amounts of Leucine lowers the level of the other two amino acids isoleucine and valine, which is why it is so important to use all three compounds together. Additionally, isoleucine is known to glukogennych amino acids, that is, that the body in an easy and fast way can be converted to him necessary for the functioning of energy. This means that we will be able not only to train longer and harder, but also recover faster. Micronized L-Valine - its presence in this combination, not only due, mentioned earlier, the need for administration of all three BCAA together but also to reduce the impact of fatigue of the central nervous system. In addition, as in the case of the other two amino acids, it is easily converted into energy consumed by the working muscles and thus saving glycogen stored in the liver. L-alanyl-L-glutamine - the most commonly occurring in the body an amino acid that plays a number of very important functions: alters the filling process, glycogen by increasing the rate of its synthesis in the liver, as well as by direct conversion to glucose positive effect on the rate of protein synthesis and limits their disintegration, it strengthens the immune system and prevent diseases that could hinder the training plays an important role in the process of transamination (to the synthesis of new amino acids) is converted into glutamic acid constituting a source of energy for the nerve tissue and perform a number of other important but less significant from our point of view, the function. Inne składniki: kwas cytrynowy, naturalne i sztuczne aromaty, sukraloza, dwutlenek krzemu. Universal Nutrition Uni-Liver - 250 tabl. It is a pure and all-natural product derived from prized grass-fed Argentinian cattle. The high quality of the amino acids makes it for years now is a product used by the best bodybuilders in the world. Swanson AjiPure L-Serine 500mg - 60 kaps. High quality l-serine in the form of capsules. The preparation is recommended for people who are looking for ways to improve concentration and improve memory. In addition, it is worth remembering that it also strengthens the immune system. Each serving is 500mg l-serine! The highest quality BCAA branched amino acids for optimal ratio of L-leucine: L-isoleucine: L-valine! Enriched with vitamin B6. Inhibit catabolism, have a positive impact on the recovery rate and the speed increases muscle mass. This is not the usual formulation comprising arginine. It is precisely selected composition of arginine alpha ketoglutarate (AAKG) combined with extremely expensive, but very effective in the operation of citrulline malate (Citruline malate). Bet on the quality!